(2) The passenger airbag ON/OFF indicator ("ON" and "OFF") comes on for approximately 4 seconds, then goes off for approximately 2 seconds. 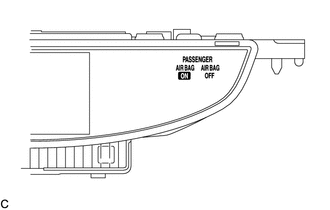 (3) Approximately 6 seconds after the ignition switch is turned to ON, the passenger airbag ON/OFF indicator will show ON or OFF depending on the conditions listed below. 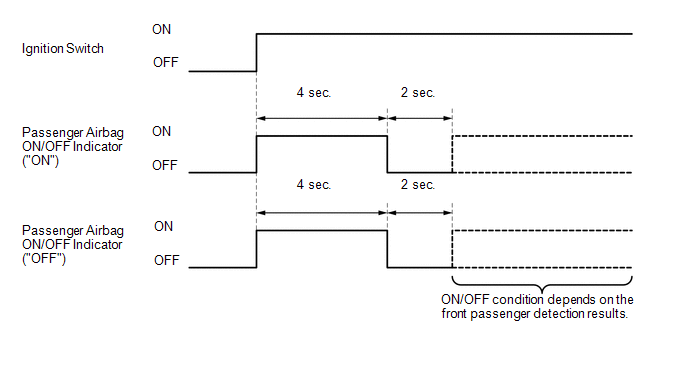 The passenger airbag ON/OFF indicator is based on the timing chart below in order to check the indicator light circuit. When the occupant classification system has trouble, both the SRS warning light and passenger airbag ON/OFF indicator ("OFF") come on. In this case, check the DTCs in the airbag system first. (b) Check that the passenger airbag ON/OFF indicator (ON and OFF) comes on for approximately 4 seconds, then goes off for approximately 2 seconds. Refer to the table in step 3 regarding the passenger airbag ON/OFF indicator when the ignition switch is turned to ON and approximately 6 seconds pass.